The 4th Annual Run to Remember WA will honor the brave men and women who have or are currently serving in our Armed Forces and remember those who have given the ultimate sacrifice fighting for our freedom. The Half Marathon, 10K, 5K and Memorial Mile running and walking event will benefit various Military Organizations. Veterans and those actively serving race Run to Remember for FREE. Email registration@whyracingevents.com with your Military service details and we will send you a comp code so you can register. It's our way of thanking you for your service! Have you ever wondered how fast you can run a mile?! Now's your chance to see if you can break the 4-minute mile? Or maybe you'd be happy with an 8-minute mile pace? Or maybe a 12-minute mile is more your speed! Regardless, the Memorial Mile is designed as a flat, fast race to go all out and see what you are made of. There will be pace waves to assure all runners can run at their maximum speed. The Half Marathon, 10K & 5K races will take place afterward and many milers may want to sign up for both events! 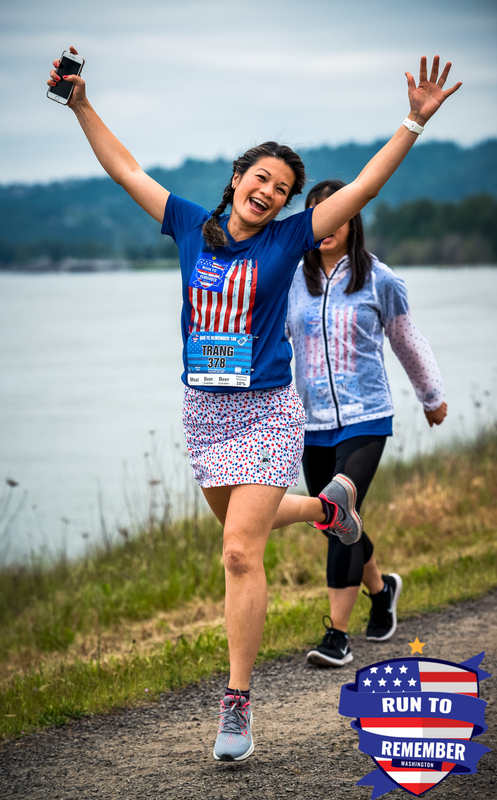 After your run or walk on the beautiful Washougal trail along the mighty Columbia River, we will enjoy food and drink and share race stories and meet Veterans or those currently serving in the Armed Forces so we can personally thank them for their service. Bring your kids so they can learn what this holiday is all about!